Over the years, we have included a dedication in emerge. If the production team would like to dedicate this year’s anthology to a specific person, we can. If the production team decides they would like to include a dedication, the following selection process will apply. During the production of emerge, the production team may solicit potential dedications from the emerge editorial team members to create a longlist. The production team will review all submissions and shortlist three dedications. These three dedications will be voted on within the collective emerge production team. The dedication with the most votes will be included in the anthology. The production team, in collaboration with the Managing Editor and Publisher, will have final say on the wording of the dedication. In emerge, the dedication appears on p. v.
Choice of dedication—including whether to include one or not—is up to the author. It may be suggested, however, that the word dedicated is superfluous. Editors of contributed volumes do not customarily include a dedication unless it is jointly offered by all contributors. Nor do translators generally offer their own dedication unless it is made clear that the dedication is not that of the original author. The dedication usually appears by itself, preferably on page v. Click here for CMS Online. You invited us to speak from the margins, to workshop with compassion, and to write with open hearts and minds. You will always be part of the TWS community. that celebrates inspiration, growth, and success together. For the Writer’s Studio—it’s mentors, instructors, and all others whose efforts have made it a special place. For all the people in our lives who said yes. 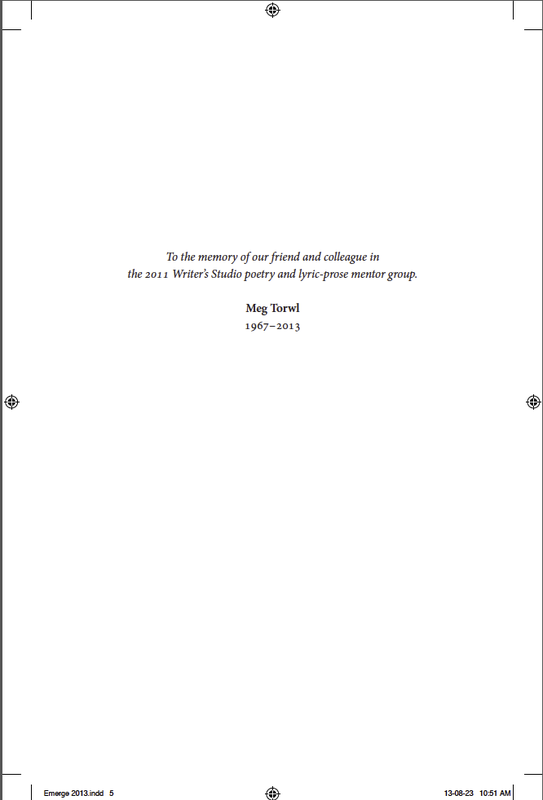 To the memory of our friend and colleague in the 2011 Writer’s Studio poetry and lyric-prose mentor group. Dedicated to Betsy Warland: Trusted director, mentor and founder of The Writer’s Studio. The Writer’s Studio has given many of us the confidence to speak, to emerge from the isolation of our silent potential, and to activate ourselves. Thank you for creating such a unique and supportive space in which to challenge ourselves.